Posted in: Uncategorized. Tagged: uvxy, VXX. That divided by 20 days is .64% per day for the VXX or 1.28% per day for the UVXY. That is about 30 cents for each ETF roughly per day of negative roll yield. All things being equal, if the Dec and Jan contracts stay at their current prices, this will be subtracted from the ETFs’ indicative value, or their NAV. You also get the bonus of Thanksgiving decay, one free day of roll without the market being open next week. So it really has to roll up in 19 days. This is a huge headwind. What can you do to take advantage of this? Sell call spreads in both, so that your risk is capped in case there is a major market sell-off due to an unforeseen event. If you anticipate that the UVXY will be less than 20 using the metrics above on the day after Thanksgiving, you can sell the $20-22 call spread for approximately .80. Your max risk is $2, but there is a ton of roll between now and then, and Thanksgiving week has a very bullish bias in the stock market. You can do the same in the VXX, say at $47-49 for .60 or the $46-48 for .80 approximately. All you need for these to work is a flat market, so that the roll can do its job. If the market goes higher, the UVXY and VXX will get hit even harder as the Dec futures head lower. Will Volatility/VIX Make a Return this Month? Posted in: Uncategorized. 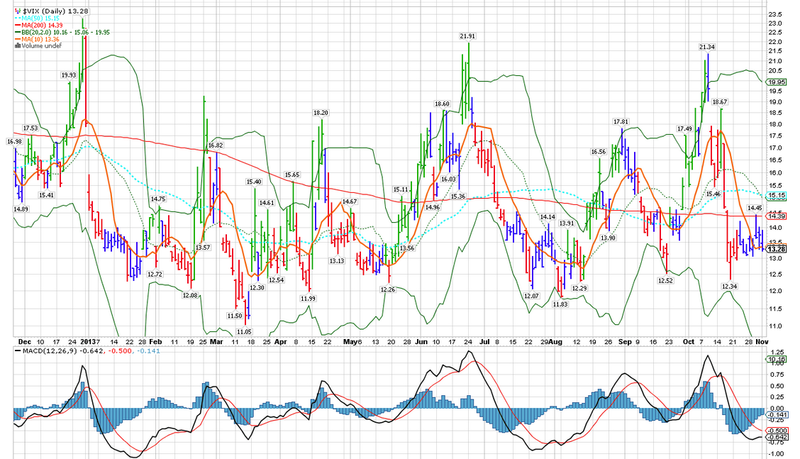 Tagged: VIX, Volatility. There has been no volatility to speak of lately, so the posts here have been thin. While my focus therefore has been on specific name volatility arbitrage, (calendar IV spreads) there are hints that volatility may rise in the month ahead. Let’s examine why. All three charts are very bearish, with MACDs rolling or crossing on every one. 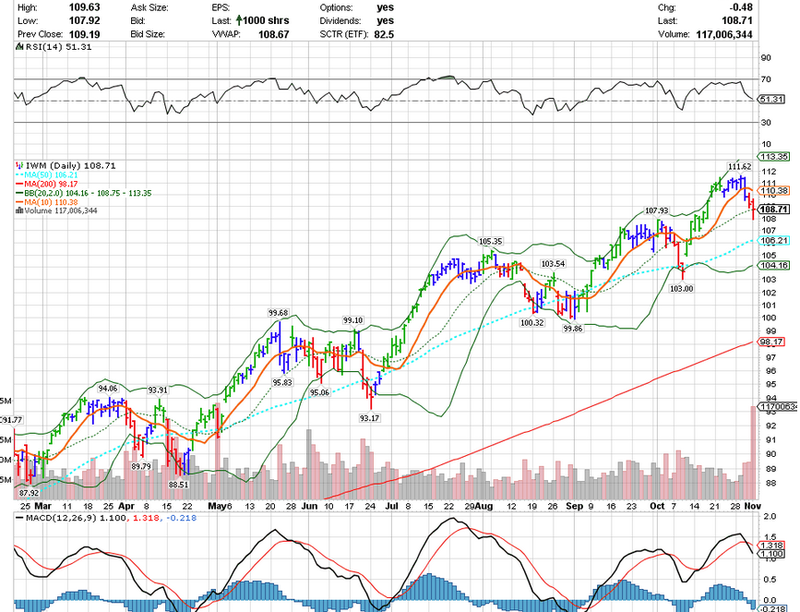 As you can see, MACD does not immediately turn around and head back higher until it resolves itself. It almost always leads to lower prices. Because uptrends do not reverse on a dime generally, (blow-offs aside) you get some chop at the top. That is what we are doing right now. But the canary in the coal mine may be the Russell 2000. It’s already only 2% above the 50 day after giving up 3% this week alone. Unlike the other indexes, it does not respect the 50 MA that much, unlike the S&P 500, which everyone watches like a hawk when it nears the 50. When the VIX sits down here, it takes 4-6 weeks generally for it to make an inevitable move higher. At least a move off of the 12-13 level. The good thing about the VIX being so low, is that you don’t have to pay much if you like downside options, anticipating a natural consolidation in stocks. One thing that works pretty well in this scenario are diagonal spreads. Let’s look at one example of how to get your risk/reward in asymmetrical shape. This is the option ladder via the fantastic LiveVol platform. I like diagonal calendar spreads in this scenario. You would sell a nearer term put at one strike and buy another longer dated put at a lower strike, thereby lowering your cost and giving you the opportunity to make multiples on a market slide. One potential trade would be to sell the SPY $174 Nov 8 put for .40 cents and buy the Nov 15 $173 put for .56, for a net debit of .16. 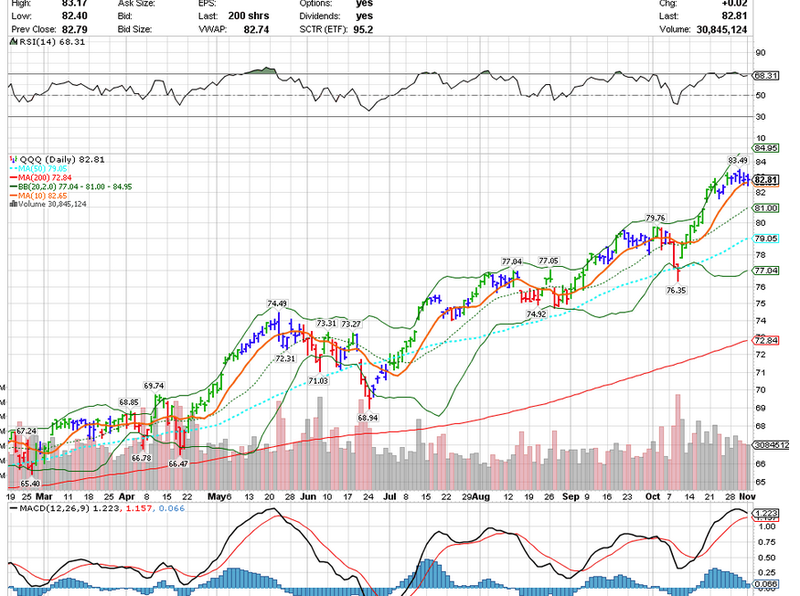 If the SPY stays flat or falls over the next two weeks, this trade will work and could be a big winner. 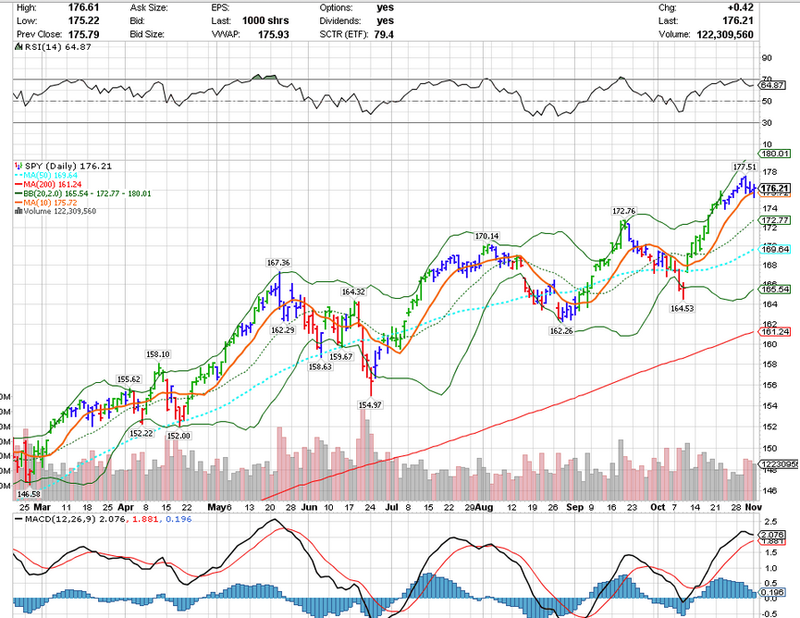 A rise in volatility will also juice the longer dated put as well. It is very hard to lose significantly on this trade. If the market stays right here next week, without even falling this trade will probably make 50%. If it falls to 174 next Friday, then you are looking at a 5x or more return, as the ATM puts for next week are worth around $1. That is without adding any vega to the put value. 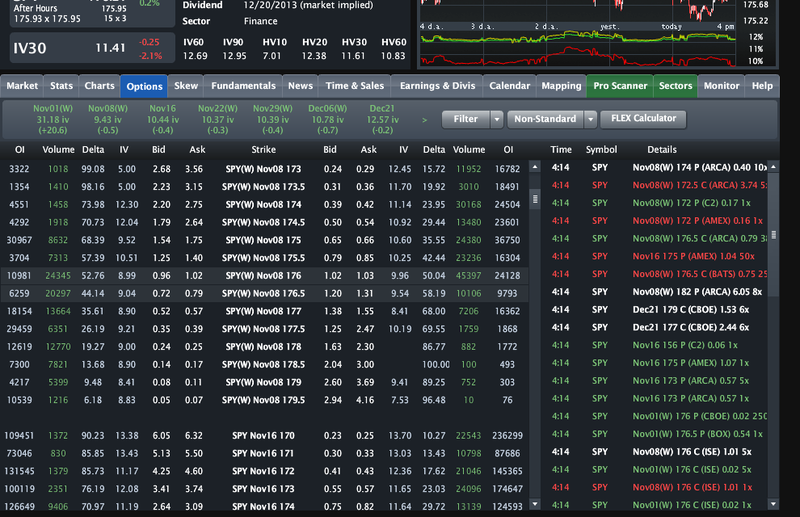 Expect more posts in the coming week with vol trade set-ups.